This entry was posted in Analysis Beyond Hurst on December 5, 2014 by David Hickson. I have started writing this post several times over the past years, and have always given up after hours of work, with pages and pages of dense comparisons and similarities between Hurst Cycles and Elliott Wave. This time I am going to publish! The problem is that the subject is such a big one, and I have a tendency to get carried away (in case you hadn’t noticed!). Before long the post is too long, and so I trash it and promise myself I’ll revisit the idea later. Well, later has arrived! A post by Sid about the AUDUSD has prompted me to publish this. My secret this time is that I am only going to scratch the surface of this vast subject by presenting a starting point for the discussion with a few simple points. I should say at the outset that I am by no means an Elliott Wave expert. I have a good understanding of Elliott Wave, and traded on the basis of my amateur EW analysis rather unsuccessfully for several years before I discovered Hurst Cycles. And so please get involved in the discussion, point out any Elliott Wave mistakes I have made, or subtleties I have missed, and share your thoughts about how Hurst Cycles and Elliott Wave work together. Of course at the most basic level there is an obvious link between Hurst Cycles and Elliott Wave Theory: they both describe cycles in financial markets. I was surprised to realize this at first because I had always focused on the concept of five moves up forming an impulsive move, and three moves down a correction, and had not considered Elliott Wave as a cycle theory per se. Of course the word “wave” is a dead giveaway. I probably didn’t think of it as a cycle theory because it is not very common in Elliott Wave analysis to speak of particular cycle lengths, whereas in Hurst Cycles analysis you are constantly doing that (here’s a fun challenge: see if you can speak for an hour about 20-week, 40-week, 20-day and 40-day cycles without getting it wrong – I know I cannot!) Of course many EW analysts do mention cycle wavelengths, but as far as I know there is no official Elliott Wave “nominal model”. And so at the most fundamental level the two approaches are both about identifying cycles in the price movement, and of course those cycles push price up, and then down again. The next interesting comparison between these two approaches has to do with what I call “cycle shapes”. Cycle shapes are not strictly speaking a part of either Hurst or Elliott, but they do form as a result of the underlying principles of both theories. 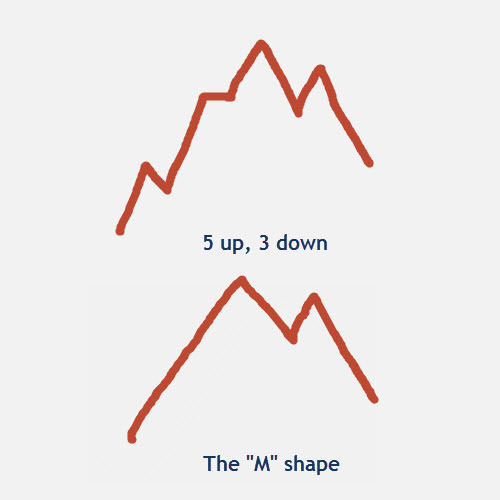 You will know that I go on a good deal about the M-shapes that cycles make in financial markets. They do this because of the way in which multiple cycles combine to influence price movement. And the way in which multiple cycles combine was defined by Hurst in his cyclic principles. You will notice in that diagram some obvious similarities. There is a lot more to be said about this, such as the fact that a corrective wave in Elliott Wave consists of a combination of impulse and corrective waves itself, and of course I have drawn a bullish impulsive Elliott Wave whereas you get bearish impulsive waves as well. But I will have to come back to these discussions in future posts. Perhaps the most fundamental concept of Elliott Wave theory is that price moves in impulsive waves which consist of five moves, and then corrective waves which consist of three moves. I know it can get more complicated, with extensions of waves, but let’s keep it simple for now. Most people who have discussed with me the relationship between Hurst Cycles and Elliott Wave see this five and three wave combination as being a point of difference, but in fact it is a remarkable point of commonality between the two approaches. Let me explain: Hurst Cycles lead us to expect M-shaped cycles, which consist of four waves (the basis of the “sentient trading methodology”). We also know that the ratio between the wavelengths of adjacent cycles in Hurst’s nominal model is mostly 2 to 1, and so for each longer cycle we have two iterations of the shorter cycle. (For instance the 80-day cycle encompasses two 40-day cycles). As each shorter cycle consists of four moves, the longer cycle consists of eight moves. And so we have the commonality of 5 + 3 = 8, and 4 + 4 = 8. There is an interesting detail here: in Elliott Wave there is a focus on the move from trough to peak, and then from the peak down to the trough, but in Hurst Cycles we are focused on the move from one trough to the next, and then to the next. 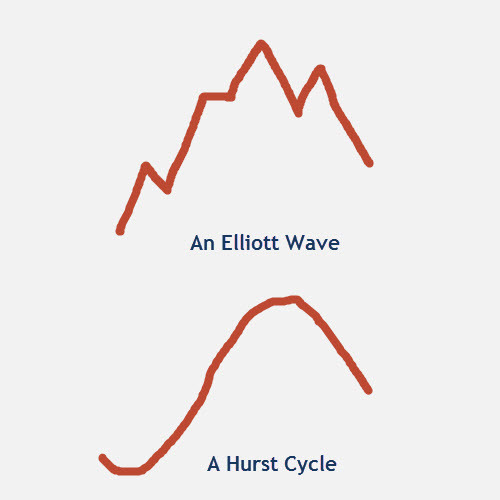 A question might be bothering you: what if the peak in the Hurst Cycle occurs after wave 3 in the Elliott Wave analysis? Because it cannot always occur in the second Hurst cycle. Elliott Wave allows for what is called a truncated fifth wave, which does not rise to a new peak. It also depends on where one starts counting the waves. This is a big area to explore, but let me plant this seed of an idea: it is quite possible that the Hurst cycle starts at the position of a wave 2 in the Elliott Wave count, or the wave 4, or the wave b … you get the idea. 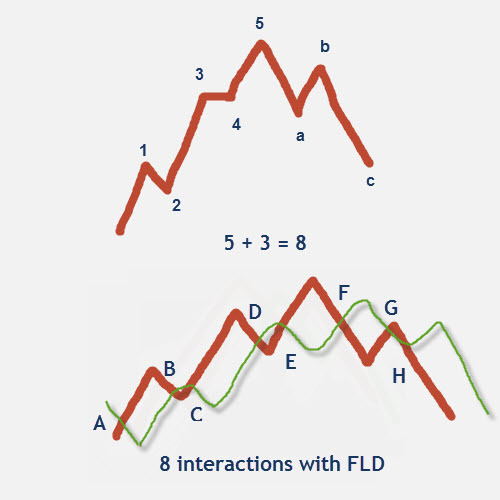 You probably know that I like to trade the interaction between price and the FLD (the FLD Trading Strategy). There are eight interactions between price and the 20-day FLD within each 80-day cycle. There is that number 8 again. This is another common ground between the two approaches. This subject also opens up another rabbit hole of comparisons and relationships, but I will leave you to consider the possibilities. Let me point out another interesting subtlety. Elliott Wave observes something called “alternation”, which leads us to expect that wave 2 and 4 in an impulsive move will take on alternating forms: if one is a sharp correction then the other is often (not always) a shallow sideways correction. This alternation is also observed in the interactions between price and the FLD. Between interactions B & C we usually see price “track along” the FLD, whereas at interaction D it usually drops sharply through the FLD. Again bear in mind that the B-C interactions are not necessarily wave 2 in the Elliott Wave count, nor is interaction D necessarily wave 4. But this idea of alternation suggests further possibilities: if we see an unusual B-C interaction which is a sharp move, should we expect a disappointing D-interaction? Price and Time: Elliott Wave focuses primarily on price moves, and uses Fibonacci ratios a good deal. On the other hand Hurst Cycles focus primarily on time. The combination of the two is very powerful – you benefit from the forecasting power of both price and time. Fibonacci ratios in time: Having said that Elliott Wave focuses primarily on price, Fibonacci ratios are often applied to time ratios in Elliott Wave (the 5 + 3 = 8 waves is pure Fibonacci after all), and there is a great deal of insight that can be gained from applying Fibonacci ratios to the time axis and see how they relate to Hurst’s nest-of-lows. The Fractal concept: Elliott Wave proposes a fractal model of price movement, and yet Hurst Cycles imply an imperfect (or nearly) fractal model because the harmonic ratio between cycles is not constant through all time frames. This results in a very interesting dynamic between the two analyses. Please share your thoughts about how Hurst Cycles and Elliott Wave work together, what they have in common, and where they contradict one another. I look forward to some very fruitful discussion. I have been trading for over 20 years, but only had any success after discovering Hurst's cyclic principles. Unable to find any software to speed up the analysis process I created Sentient Trader software, which now pretty much does all the analysis for me. I am a film maker and a TV director, but nowadays I mostly provide consultation services to professional traders and fund managers, helping them to integrate Hurst analysis into their trading. I'm South African and live with my family in Italy. i am glad you opened up the Rabbit hole , i have been looking at and trying to marry the Two together for sometime now and I found clear links between two analysis. i will share more thoughts in near future.The unforeseen . objective parts of both analysis forming the biggest challenge for me ,as in both analysis it is always clearer after the event took place , be the counts or the troughs. Your 20 day fld strategy is pretty spot on observation i felt for a long time and I do think it can be greatly improved having elliot wave and price action patterns knowledge in our arsenal. For example timing wise b and d stages could identify clear opportunities and e can identify the top in recent move. I did look at this calibration carefully in recent correction in US markets where SP 500 did indeed do the a b c correction or F_G_H in your terms and Sentient timed it almost to Perfection in October 15 U turn and if we add that the price reacted right on the bottom line of the recent 3 year channel and fib ratios etc .. you get the idea !!!! Doesn’t get any better than that my Friend !!! I must say I did miss the later chunk of this recent up move due to me turning extra bearish for sometime which proved me wrong ( assumptions are never good in this business , just didnt see and expected longer 18 month cycle kicking in ) but even then we still could get in relying on Hurst after the most recent peak which was 2019 ish. Now one last thing the projection of 1.618 Fibo expansion going back 2007 coincides with Sentient’s recent projection box for the up move which is 2150 in SP 500 , Now that number as you said may be reached in March somewhere if not earlier and There I am Turning the GREATEST BEAR there is reason being it feels spot on price range for the recent 4.5 , 9 and possibly 6 year cycles peak ! Thanks Vito. Yes it is easy to turn bearish early. Those peaks are tricky! Very interesting that the 2150 target mentioned by John is also a Fib ratio. I am myself using the 2 analysis as the strengh of Elliott waves is that you can well localise your price within the development of the wave, and can make some estimates of future movements, but Hurst cycle is the better tool for timing purposes. The truth of the pudding comes when eating it, and here we are: EW analysis shows that the probability of a meaningful correction in western stock markets to happen soon is quite high, and that we even might be already on the downside of the cycle. You came yourself based on Hurst to the same result some month ago, but troughs are not to be found were we expected them, so let us see what happens. I am sure that eventually, both analysis will be in harmony. Hi Georges. 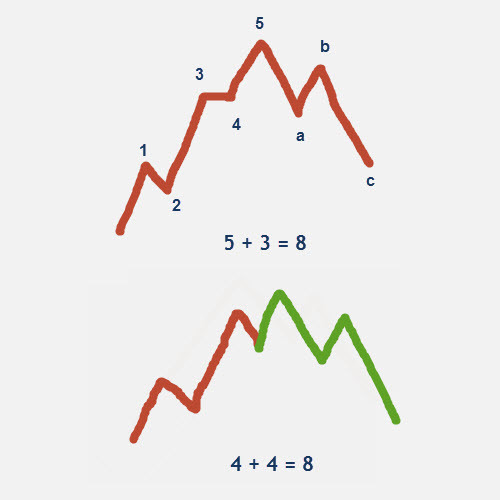 It will be very interesting to see how the two approaches work together, particularly as we approach the peak. Great post. I learned Prechter’s version of EW as a first technical analysis method, but like you, I moved to the time based method of Hurst. EW works great when counting an impulse or a simple correction. Its when you get into complex corrections that I get lost and these combinations of 2 or more wave sets along with the odd X wave, and well you just don’t know where you are except in a sideways mess (and probably a nice bear market). One thing to note as an exception are wave extensions. Certain markets almost always yield an extended wave and the waves then appear more as 9 waves up and 3 waves down for a total of 12. There are other realities that come with wave extensions but I will leave it there. So the big debate in my mind is where is the S&P in its EW sequence? I have drawn charts in the past to count Hurst cycle lows which coincide with wave 2 and 4 wave lows of different degrees. The recent October low was a 4th of a larger degree, and the Feb. low was a 4th of a lessor degree. Now we wait to see how this potential 5th wave unfolds. Thanks for your post David. You always find something thought provoking to write about. Thank you John. Whenever I run out of things to write about something tends to happen! The markets never disappoint. I agree with the assumption that a marriage between the two could be a fruitful one. I’m focusing more on EW at the moment (I’m not a member here) but the timing of your Hurst cycles can indeed add a nice additional layer of analysis. So after reading this blog post I went searching for the freely shared eur/usd charts, but they do not seem to be on the website anymore? Such a shame, would be perfect to observe similarities between the two strategies! After reading Profit Magic (see chart on pg. 54) it was instantly obvious to me that an idealized complete Elliott “market cycle” as defined in Prechter’s excellent book (pg. 22-25) is a dominant price wave riding on a price wave four times longer with a positive underlying trend. The nomenclature is little different (i.e. a “wave” to an Elliotician is a half cycle to a Hurstonian). All of the various idealized Elliott patterns can be explained in terms of the phase relationships and amplitude modulation of the various price waves. However, because EWT is non-time based, a spectral approach is inapplicable. The resulting “wave counts” and “alternative wave counts” seem to me to be a bit more complicated and subjective than Hurst’s approach, regardless of whether one uses Hurst’s time domain approach or his spectral domain approach. I’m surprised that Ellioticians do not make more use of non-time based charting. Hi William. That always surprised me too, that Elliotticians don’t use time based charts. It is interesting that Robert Prechter often makes reference to time in his analysis although it isn’t an integral part of the theory. as many I worked first with Elliott Waves (in 1972). I have a lot of reservations on Elliott Waves. Before writing them on this blog, I prefer to hear first what you have to say. Your first post being very insightful. Read again “The Wave Principle ” from Elliott, and count the terms cycle, cyclic, cyclical you will find roughly 100 occurences for 23 pages, almost 4 occurences per page. Hello Alain. That is a very interesting observation. There is definitely an issue surrounding nomenclature and definitions. I know I find it hard enough when recording videos to say trough or peak at the right time, let alone cycle or wave. And the hardest is 20-day, 20-week and 40-day, 40-week! Hello everyone. Thank you so much for your comments. Apologies for my delayed response, I am fighting a losing battle with gmail which sends all the really important and interesting mail into my spam folder! David I am very glad you agree on this point. a cycle being composed of 2 swings an up one and a down one. If you attentively read “Profit Magic” you will notice that the use of the words ” cycle, wave and component” are for “Hurst” more or less interchangeable. There too there is no definition of what is a cycle , a wave or a component. This fact lead to write some years ago on a forum well known by John the hypothesis that “Profit Magic ” could have been the synthesis of the thoughts and findings of several writers using diferent wordings to characterize more or less the same thing. I was publicly shot on the wall to have written such heretic thoughts. What a wonderful story Alain, I didn’t realize you were such a heretic! Your suggestion of component or swing is a good one. wave subliminally underline the up and down “swing” and the initial impulse (quantum of energy which determines the change of level in Price – which needs Time to be reached. Hurst describes in the profit magic that the price we see in the charts is formed by cycles of different lengths and amplitudes superimposed on eachother. Hurst analists often assume that these cycles synchronize, but in fact often they do not. Not-synchonous is what causes the well known patterns like head-and-shoulder, tringles, pennants etc… (according to profi magic), but it also causes elliot like patterns. Not-synchrous hurst cycles = elliot waves. Google for the document ingramelliot.pdf by Ric Ingram. It might give some insight. I partially agree with you. 2/3 of the shares of the French CAC 40, 75 % of the shares of the DAX 30 and 70 % of the shares of the DJIA made a low in march extended 2003 and march extended 2009. March extended = end of february / beginning of april. That is also a sign of commonality. You can observe that 10 to 15 % of the shares of these 3 indexes made their the previous year (2002,and 2008) at theend of october beginning of November. According to the variation in phasing (relative time position) and duration of the various cycles of inferior duration you can observe a kind of “saving account”. Cycles at the end of each rotation accumulate credit or debit in time (and amplitude) and at certain important lows made a “reset” to balance their account and respect their average. Wish I knew more about Hurst cycles (and I plan to learn), but I can contribute a bit about Elliott Wave as there is a time element. One of the biggest hurdles for any Elliottician is identifying which degree of trend each wave is in, and to help keep things proportionate we use channels, which have a time element as well as price. If something goes sideways for too long and breaks a channel, then I start to consider that that particular degree of trend, or cycle, may be over. Have a look at this beautiful channel on SPX. Time and price interacting. Also how there is a time/price relation to wvs 1, i and 5, v. This is fractal and I think it is due to positions being wound and unwound around the central trend (wave 3). This channel is due to be broken, but the next degree of trend will have its own channel, and, depending on time, will come into play around 1850ish. The longer the cycle takes to go down, the higher the channel will be. Stating the obvious perhaps, but maybe of use. Register now to join us in our live Hurst Cycles webinars - FREE! Enter your email address to receive Hurst Cycles posts hot off the press direct to your inbox! 30YR US T-Bonds : The Big Long – Is it over? If you don't already have Hurst's book THE PROFIT MAGIC OF STOCK TRANSACTION TIMING it is an absolute must read! We use NOZBE to get things done and be productive. Risk Disclosure: Futures and forex trading contains substantial risk and is not for every investor. An investor could potentially lose all or more than the initial investment. Risk capital is money that can be lost without jeopardizing ones’ financial security or life style. Only risk capital should be used for trading and only those with sufficient risk capital should consider trading. Past performance is not necessarily indicative of future results. Hypothetical Performance Disclosure: Hypothetical performance results have many inherent limitations, some of which are described below. No representation is being made that any account will or is likely to achieve profits or losses similar to those shown; in fact, there are frequently sharp differences between hypothetical performance results and the actual results subsequently achieved by any particular trading program. One of the limitations of hypothetical performance results is that they are generally prepared with the benefit of hindsight. In addition, hypothetical trading does not involve financial risk, and no hypothetical trading record can completely account for the impact of financial risk of actual trading. for example, the ability to withstand losses or to adhere to a particular trading program in spite of trading losses are material points which can also adversely affect actual trading results. There are numerous other factors related to the markets in general or to the implementation of any specific trading program which cannot be fully accounted for in the preparation of hypothetical performance results and all which can adversely affect trading results.